Chicamocha National Park, Colombia. The highway from San Gil to Bucamaranga was one of the most spectacular (if not the most spectacular) paved roads I have ever had the pleasure of riding. 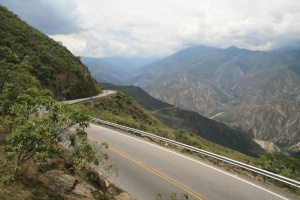 The road winds along the top of a mountain range thousands of metres above the Chicamocha canyon. (You can see Ted rounding a curve in the distance in the top left picture.) The road then plunges down into the valley, switchbacking its’ way down a steep mountain. The rapid change in altitude is dizzying. From above, the curves and switchbacks look almost like a go-kart track (as seen in the picture on the bottom right). Somehow this avian perspective hides the staggering altitude change between each parallel ribbon of highway. At the top, the weather is cool, but by the time you are riding beside the river, the heat is suffocating. If it weren’t for the heavy bus and truck traffic, this would be my all-time favourite section of paved road anywhere. 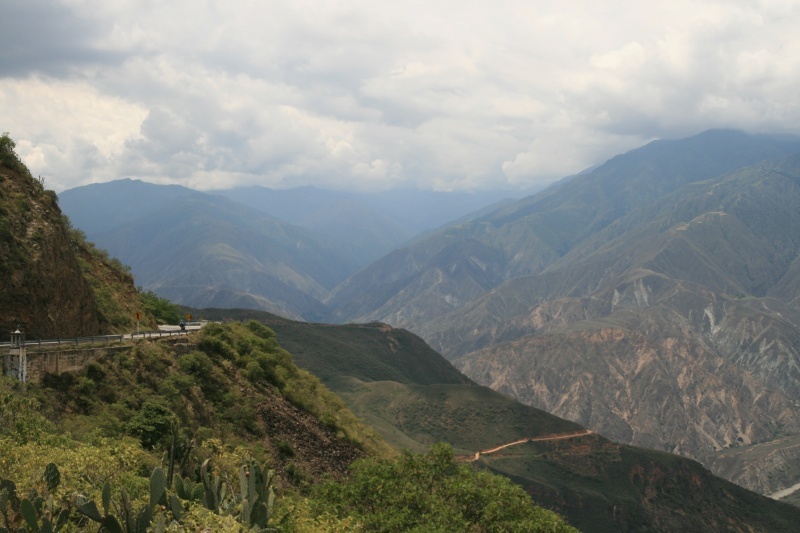 Because Chicamocha was so congested, I have also included Copper Canyon, Mexico (below) as a runner-up. It is not as gravity-defying as Chicamocha, but riding through Copper Canyon is about as much fun as you have riding a motorcycle on a paved road. The scenery is mind-blowing, and you could easily ride on smooth twisty asphalt for hours without seeing another vehicle. Unfortunately, I was enjoying the ride through the main canyon so much that I didn’t even stop to take any pictures. The pictures below were taken in a side canyon shortly before we reached Copper Canyon proper. Humahuaca, Jujuy, Argentina. We discovered Humahuaca by accident. From the highway, it looked like an ordinary dusty town typical of northwestern Argentina. However, it was lunch time and we were hungry, so we left the highway looking for food. Suddenly we were riding down cobbled streets through an outdoor craft market with cafes and restaurants all around us. It was a pleasant surprise. I ordered Llama, which was delicious. Villa de Leyva, Boyaca, Colombia. We were lost when we stumbled across Villa de Leyva. We were trying to find the highway to Bucamaranga from Tunja. All morning we had been riding through arid mountainous terrain that reminded me, unexpectedly, of New Mexico. It turned out that we were not on the right road, but it was a lucky mistake because Villa de Leyva was gorgeous. Its bright white colonial buildings, flowery inner courtyards, and stony streets made me feel like I had travelled backwards in time. The picture on the right shows the view from our table in the courtyard restaurant where we ate lunch. Antigua, Guatemala. I fell in love with Antigua. It was a colonial gem surrounded by towering volcanoes, one of which was spewing ash into the sky. It felt like a scene from a fantasy novel. The picture on the bottom shows our hotel. You can see my motorcycle parked safely in the lobby.